Enjoy the comforts of home and a great location in the Kent Narrows area. The Best Western Kent Narrows inn is located near the Chesapeake Bay and within walking distance to many local seafood restaurants and dock bars. Inside this Grasonville-area hotel, guests will find each guest room comes complete with HD satellite television (HBO and Cinemax) and free fiber optic high-speed wireless Internet access. Other amenities at this Kent Narrows hotel also include a free breakfast each morning featuring a deluxe continental breakfast, a relaxing indoor swimming pool and hot tub, on-site exercise facility and guest laundry. Staying on business? The Best Western Kent Narrows Inn offers business services, meeting facilities for up to 50 guests, and a great location near many of the local business parks. Outside this Grasonville hotel, guests will find the best of the area. Play a round at one of our local golf courses. No matter what you're interested in while visiting, our friendly staff can help you plan the perfect Eastern Shore getaway including hunting and fishing. While in town, don't miss out on annual events, like the Bay Bridge Boat Show and the Chesapeake Bay Wine Festival held at the Bay Bridge Marina, the Maryland Seafood Festival and the Polar Bear Plunge held at Sandy Point State Park. Here for a wedding? The Best Western Kent Narrows Inn offers an amazing location near popular wedding venues, like Chesapeake Bay Beach Club, Silver Swan Bayside, Queenstown Harbor, Kent Manor Inn, Prospect Bay Country Club, Maria's Love Point Bed & Breakfast and Kent Island Yacht Club. 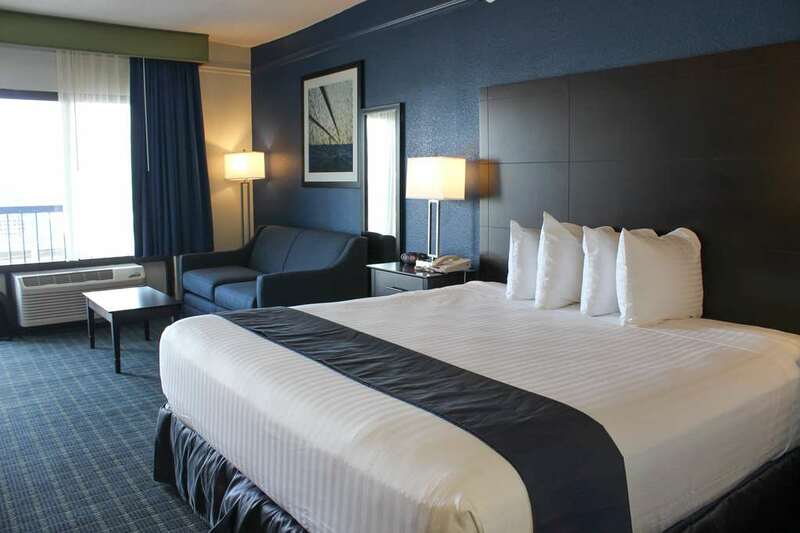 Whether traveling for business, leisure, adventure or romance, the Best Western Kent Narrows Inn is the ideal place to stay while in the Grasonville and Chesapeake Bay area. Book today to save! Enjoy your stay. Big Bats Cafe: 5.00 mile(s) from Big Bats Cafe, cafe, American, open for: lunch, dinner, Sports Bar / Grill. Open from 11 AM Midnight Sunday-Thursday , 11:00 AM - 2:00 AM Friday and Saturday. Annie's Paramount Steakhouse: 0.04 mile(s) from Annie's Paramount Steakhouse, full service, American, open for: lunch, dinner, Open from 11:00 a.m. to 10:00 p.m. daily. Serves Brunch on Sunday mornings. The Big Owl Tiki Bar: 0.20 mile(s) The Big Owl Tiki Bar, bar/lounge, American, open for: lunch, dinner, Opens at 11:00 am daily. Seafood, munchies, sandwiches and salads. Open Seasonally. Chick-Fil-A: 2.10 mile(s) from Chick-Fil-A, fast food, American, open for: breakfast, lunch, dinner, Closed on Sundays. Hemingway's Restaurant: 5.00 mile(s) from Hemingway's Restaurant, full service, Seafood, open for: lunch, dinner, Open from 11:00 a.m. to 10:00 p.m. daily. R's Americantina: 5.30 mile(s) from R's Americantina, full service, Tex-Mex, open for: lunch, dinner, Also has a lounge area. Carmines NY Pizza Kitchen: 2.00 mile(s) from Carmines NY Pizza Kitchen, full service, Italian, open for: lunch, dinner, Open daily for dine-in or carry out. Pizza, Pasta, Salads, Subs. Red Eyes Dock Bar: 0.03 mile(s) from Red Eyes Dock Bar, full service, American, open for: lunch, dinner, Opens at 11:00 a.m. daily. Live Bands on weekends. Waterside Restaurant and Bar. Holly's Restaurant: 3.00 mile(s) from Holly's Restaurant, full service, American, open for: breakfast, lunch, dinner, 7:00 a.m. to 9:00 p.m.
Rustico Restaurant & Wine: 4.30 mile(s) from Rustico Restaurant & Wine, full service, Italian, open for: lunch, dinner, Opens at 11:00 am daily. Ledo Pizza: 5.00 mile(s) from Ledo Pizza, full service, Italian, open for: lunch, dinner, 11:00 a.m. to 10:00 p.m.
Harris' Crab House and Seafood: 0.03 mile(s) from Harris' Crab House and Seafood, full service, Seafood, open for: lunch, dinner, Views of the Chesapeake Bay (Narrows area), docking available on site. Open from 11:00 am - 10:00 pm daily. All you can eat specials for in-season items. Beach - 7.00 mile(s) from Matapeake Beach, Located on the Chesapeake Bay on Kent Island, the beach grounds include fabulous views of the Bay Bridge, an outdoor amphitheater, trails through the surrounding woods, and a family picnic area. Boating - 21.00 mile(s) East from Tuckahoe State Park, 3800 acres with walking trails, 60 acre lake for fishing and boating. Hunting - 24.00 mile(s) from Schrader's Outdoors, more than 25,000 acres of prime Eastern Shore hunting properties. Driving range - 21.70 mile(s) from Hog Neck Golf Course, 18-hole Championship golf course as well as 9-hole Executive course, driving range, putting green and chipping green. From: Baltimore, MD. Follow 695 to I-97 South. Follow I-97 South to Route 50 East. Follow across the Bay Bridge. Continue after the bridge and take Exit 42. Turn right at the stop sign, go about half a mile and the Best Western Kent Narrows Inn is on the right hand side. From: Washington, DC. Follow 495 to Route 50 East. Follow across the Bay Bridge. Continue after the bridge and take Exit 42. Turn right at the stop sign, go about half a mile and the Best Western Kent Narrows Inn is on the right hand side. Downtown Annapolis,20.00 mile(s) from Downtown Annapolis, restaurants, shops, museums, art, history and fun for all ages. Anne Arundel Community College,18.60 mile(s) from Anne Arundel Community College, located in Arnold, MD just off Route 2. Chesapeake Community College,8.00 mile(s) from Chesapeake Community College, located in Wye Mills, MD just off Route 50. Features Todd Perfmorming Arts Center. Cross Island Trail,0.10 mile(s) from Cross Island Trail, spans Kent Island west and east, from Terrapin Nature Park on the shores of the Chesapeake Bay to the Kent Narrows. Matapeake Beach,9 mile(s) from Matapeake Beach, public beach open year round, clubhouse open May - September. There is a special section of beach for you and your dogs to enjoy swimming in the Chesapeake Bay. KI Federation of Art,3 mile(s) from KI Federation of Art, open Wednesday thru Friday 1:00 p.m. - 4:00 p.m.
Chesapeake Bay Envirnmental Center,8 mile(s) from Chesapeake Bay Envirnmental Center, Open 9:00 a.m. to 5:00 p.m.- 7 days/week, excluding major holidays.